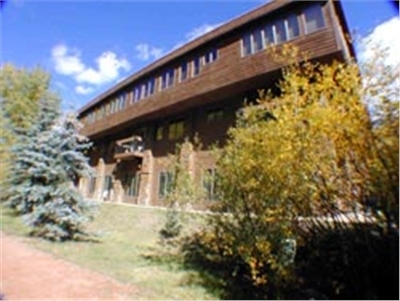 The Ghostriders codominium complex is located very centrally in downtown Telluride. The San Miguel River flows just feet away from the complex and the town park is two short blocks away. Lift #8 and the gondola are one and a half blocks away; making this an ideal location for festivarians and winter enthusiasts alike. 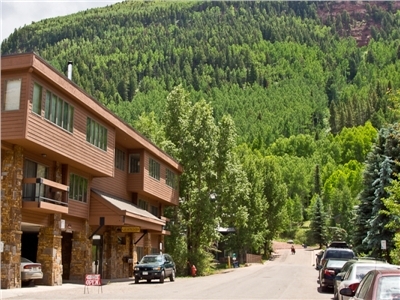 The Ghostrider complex is conveniently located two blocks from downtown Telluride and two blocks from Lift 8 and the gondola. This gorgeous newly remodeled 4 bedroom, 3 bathroom condo has a king bed, a queen bed, 2 twin beds and 2 twins beds. Go up 2 flights of stairs to the top floor and go out on the outdoor walkway to the condo. 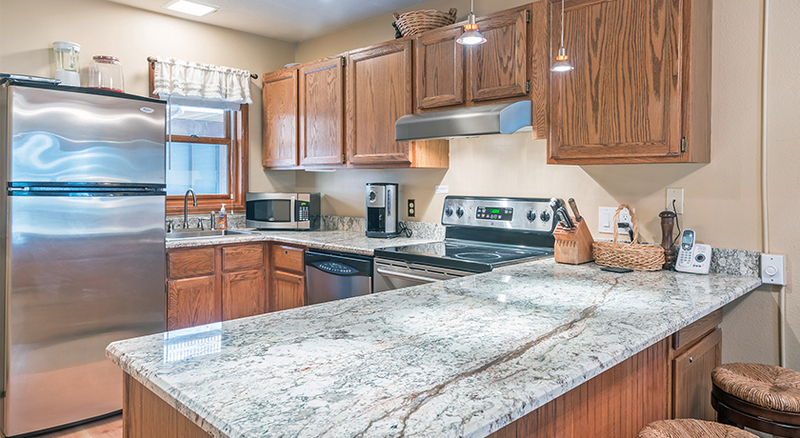 Inside, there is a full kitchen with granite counter tops and stainless steel appliances and a breakfast bar with seating for 3. 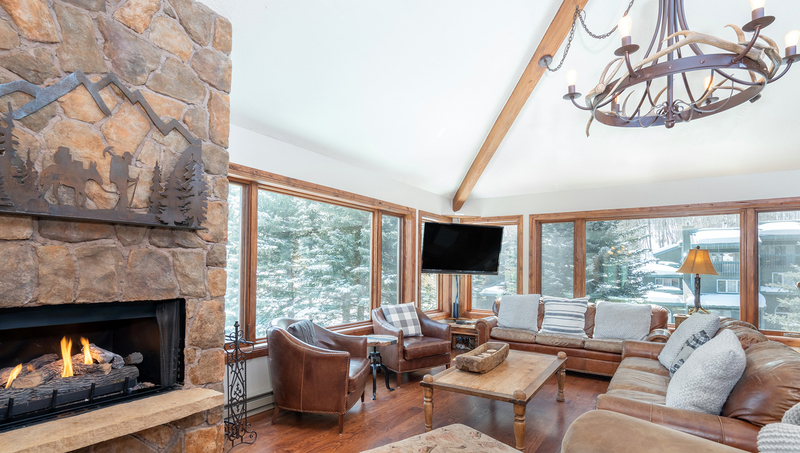 In this light and open area there is also a dining area with seating for 6 guests and living room with a flat screen TV w/DVD, sofa with chase seating and striking views of Ajax, Ingram Falls and the Box Canyon. All 4 bedrooms are on this level, as well. The 1st bedroom has 2 twin beds. The 2nd bedroom has 2 twin beds as well. These two bedrooms share a bathroom with shower/tub combo in the hallway. In the 3rd bedroom is a queen bed and it has a nearby bathroom with a shower/tub combo. The master bedroom has a king bed, flat screen TV and an ensuite bathroom with large shower. 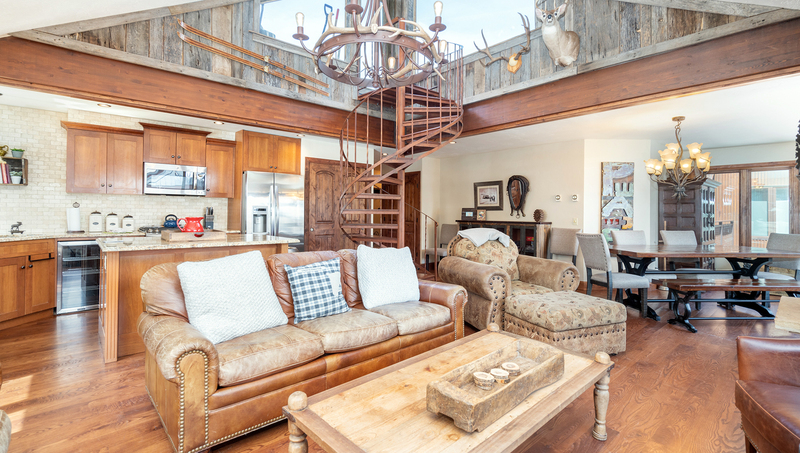 Up the spiral stairs is a furnished roof top deck with incredible views of Ajax Peak and Ingram Falls. The deck also has a small propane grill. 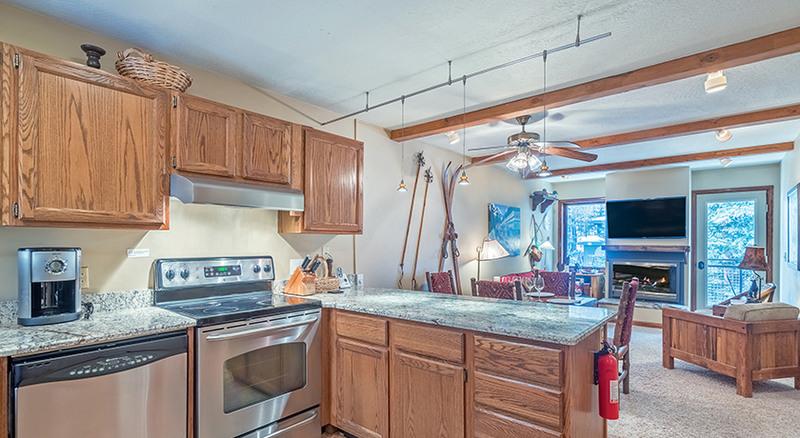 Other amenities include a washer/dryer and wireless internet in the unit, common outdoor hot tub and covered parking. This top floor condo has stunning views of Ajax Peak, Ingram Falls and Bear Creek, three bedrooms, and rooftop deck. Beds: King, queen, 2 twins, and a queen sofa sleeper. Through the main entrance of the building, go up two flights of stairs, then find the condo on the open-air walkway. 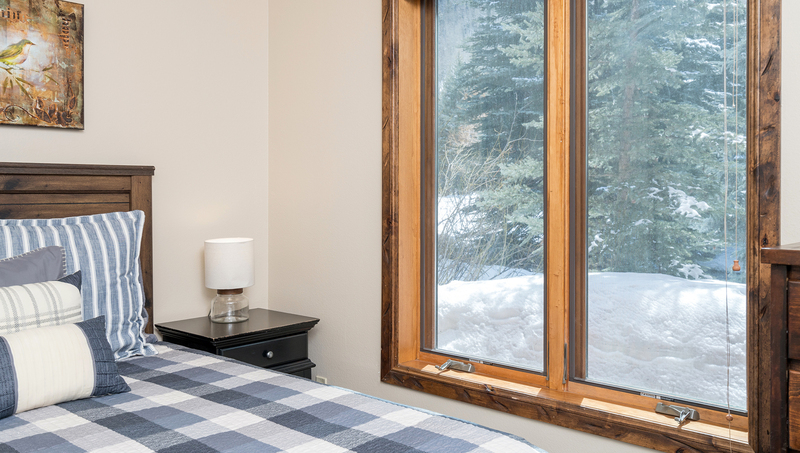 Enter the unit, renovated and redecorated in 2017 in a rustic, mountain feel with one-hundred-year-old barn wood accents. 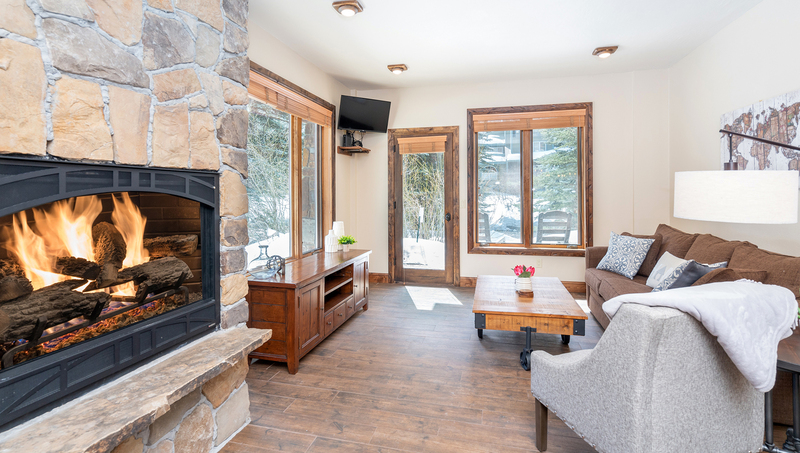 The great room features a stone gas-fireplace and the best panoramic views of Ajax Peak with Ingram Falls, and even takes in Ballard Peak. Thereâ€™s also an HD flat screen TV with DVD for entertainment, as well as games and puzzles for the whole family. 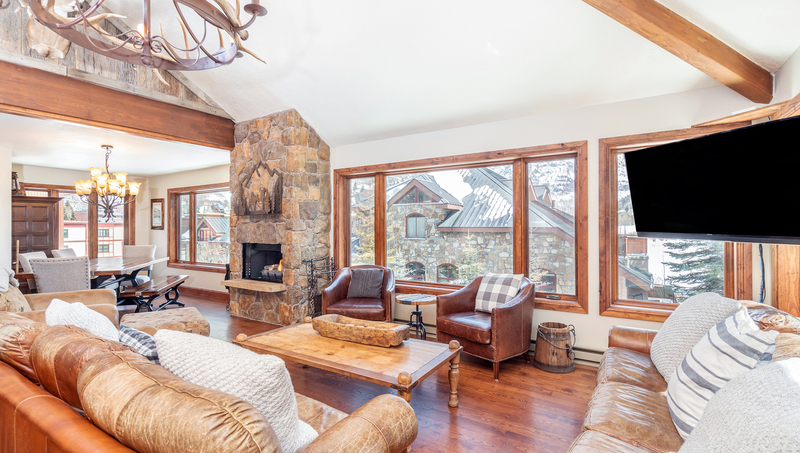 A cozy oversized chair and ottoman sit just in front of the beautiful stone, gas fireplace. The new dining furniture seats eight or more comfortably. It has a beautiful open floor plan with near panoramic views. Use the telescope to zoom in on Ajax Peak or star gaze at night. There is comfortable seating for nine in the entertainment area. 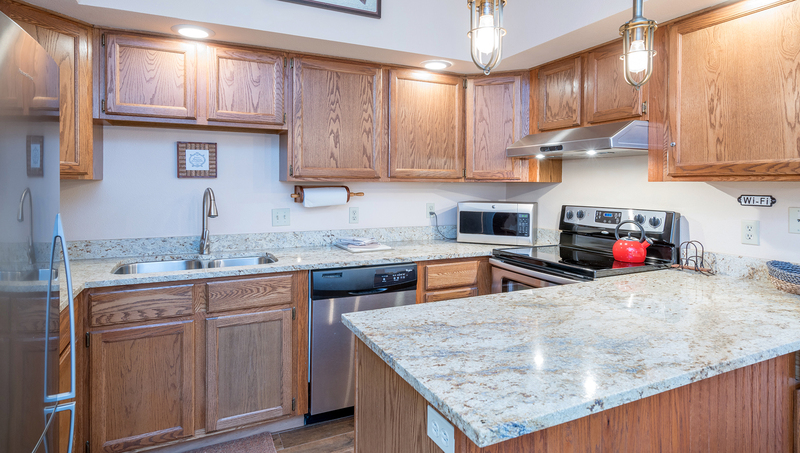 The full kitchen is open to the living room and has granite and travertine, an island and two bar stools, a gas oven and range, and updated appliances including Keurig coffeemaker, crockpot, and mixer. Up the spiral stairs, enjoy the amazing views of Ajax Peak and Bear Creek, and music of the summer festivals, from the 800 sq. ft. rooftop deck. The deck is furnished and has a gas grill, perfect for summer dining or gatherings. To the right of the entry on the main floor is the hallway to the bedrooms and bathrooms. The first has two twin beds, a flat-screen TV with a built-in DVD player and a private bath with a steam shower only. The second bedroom has a queen bed with a flat screen TV with a built-in DVD player. Across the hall is the bathroom with a shower only. The master bedroom has a king bed, flat screen TV with built-in DVD player, a private bath with a shower only. There is also a pack n play with sheets stored underneath the master bed for guest use. All bathrooms have in-floor heat. 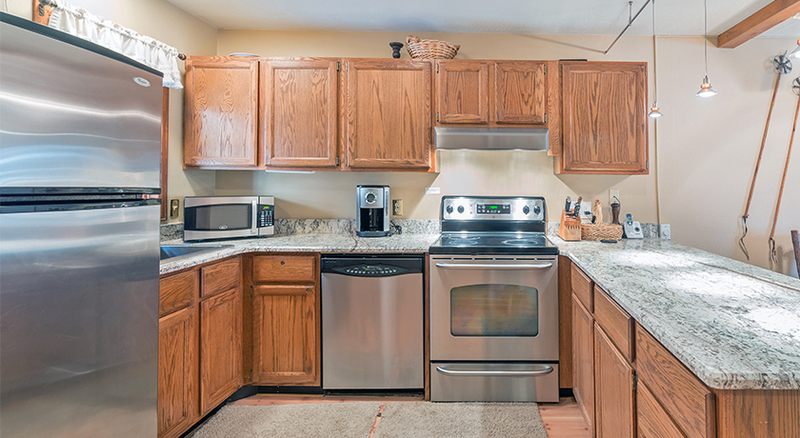 The condo has its own full-sized washer/dryer in the hall and complimentary wifi throughout. 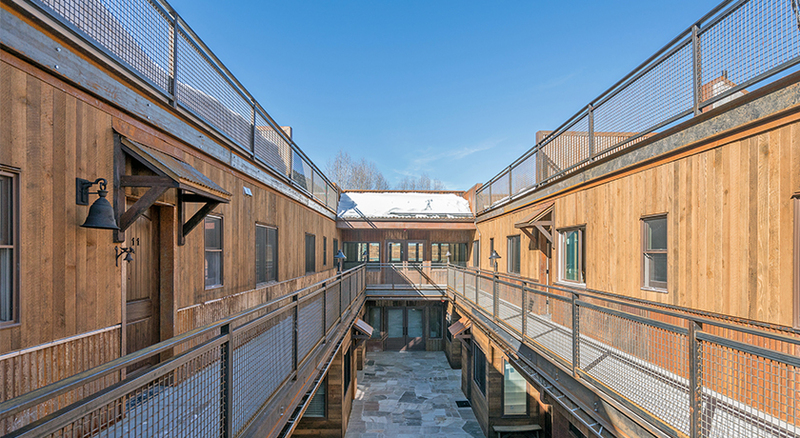 Other amenities include a common outdoor hot tub, common laundry facilities, covered parking for one vehicle, and a ski locker on the ground level. The Ghostriders complex is in a great location! 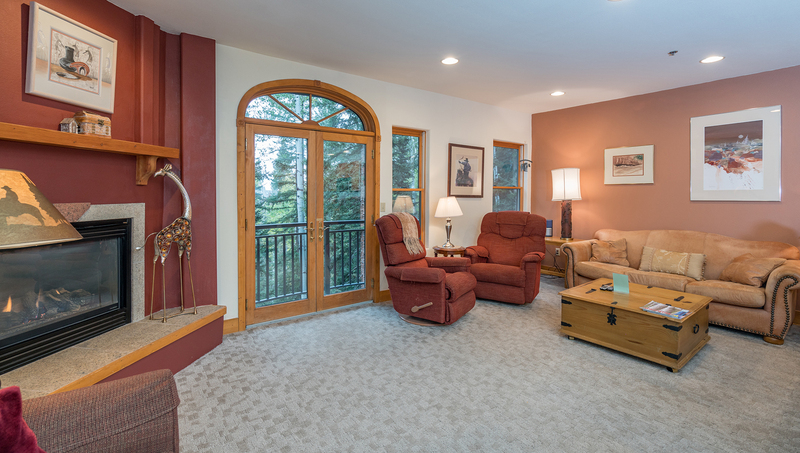 It's a block from the heart of historic downtown Telluride, two short blocks from the Gondola and Lift 8, and sits on the San Miguel River, across from the Beaver Pond and Town Park. You are just steps away from restaurants, shops, skiing, hiking, and Summer Festivals. 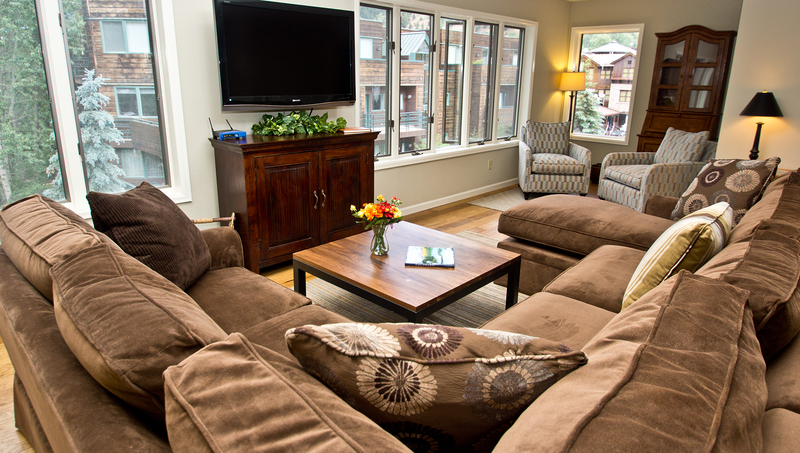 Conveniently located in the heart of Telluride, Ghostriders is a short walk from the ski lifts, downtown and Town Park. Bedding: Queen bed and queen sleeper sofa. This condo is located on the ground floor. 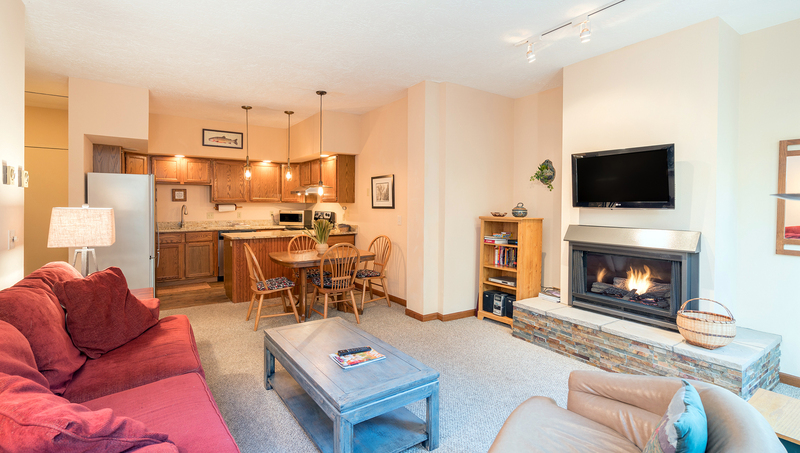 From the garage, you walk into the condo and step into the living room with a gas fireplace, TV w/DVD, CD player and a queen sleeper sofa. Open to the living room is a full kitchen and dining area that seats 4. The bedroom is located off the kitchen with a queen bed. The bathroom on the hallway has a shower and tub combo. Ghostriders has a common outdoor hot tub upstairs in the courtyard and laundry room. There is a parking garage at first-come-first-serve basis. Any additional vehicles can be parked at the Telluride commuter lot on the west side of town. Lift #8 and the Gondola are 2 blocks away, as is the main street of historic Telluride. The San Miguel River and hiking trail is right outside the condo door. Town Park is only a block away, so for summer festivals, this is an awesome place to be. 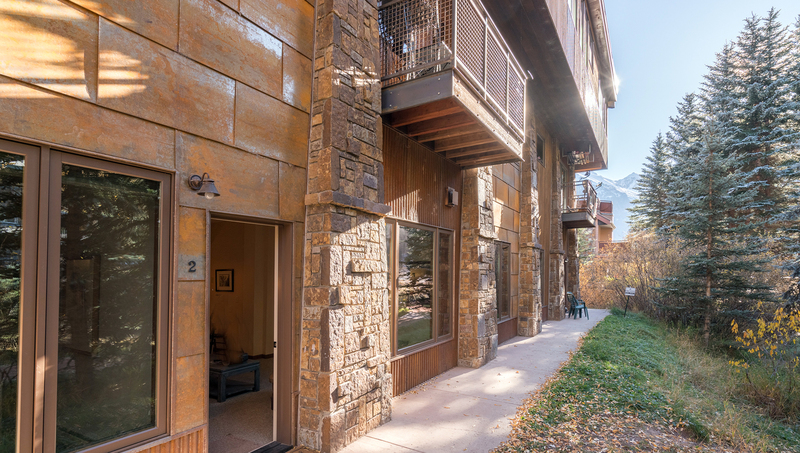 Conveniently located in the heart of Telluride, the Ghostriders complex is a short walk from the ski lifts, downtown and Town Park. Ghostriders 3 is a beautiful end unit with plenty of light, brand-new finishes and a beautiful kitchen. Bedding: Queen bed, two twin beds and a queen sleeper sofa. Ghostriders 3 got a full remodel in 2018 - Check it out!! This condo is located on the ground floor of the Ghostriders building and has access from the garage. As you walk into the condo, you're welcomed into a large, open area with walls of windows and a river view. 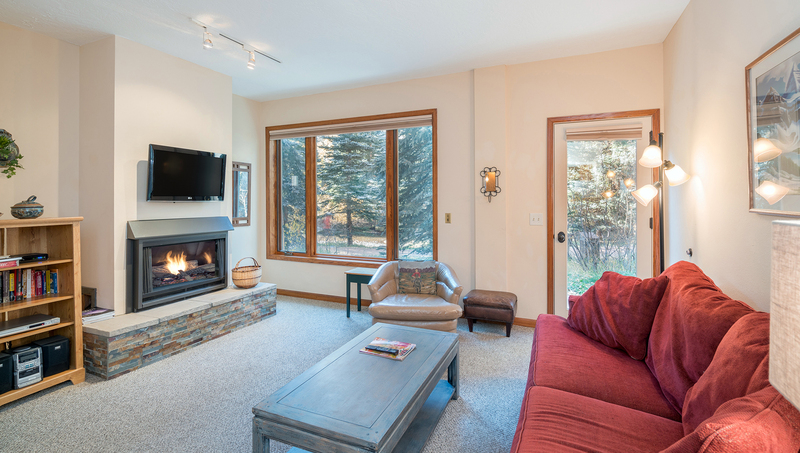 The living room features a gas fireplace, queen sleeper sofa and a 32-inch flat-screen smart TV. A door leads to a small patio with a gas grill that has views of the San Miguel River - perfect for morning fly-fishing. 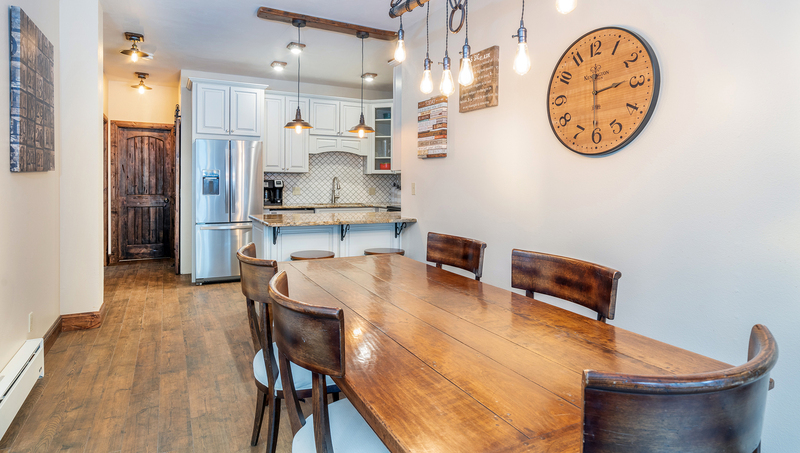 To the right of the entrance is a large dining room table with seating for six that opens up to the newly remodeled kitchen. There are two additional barstools at the breakfast bar. 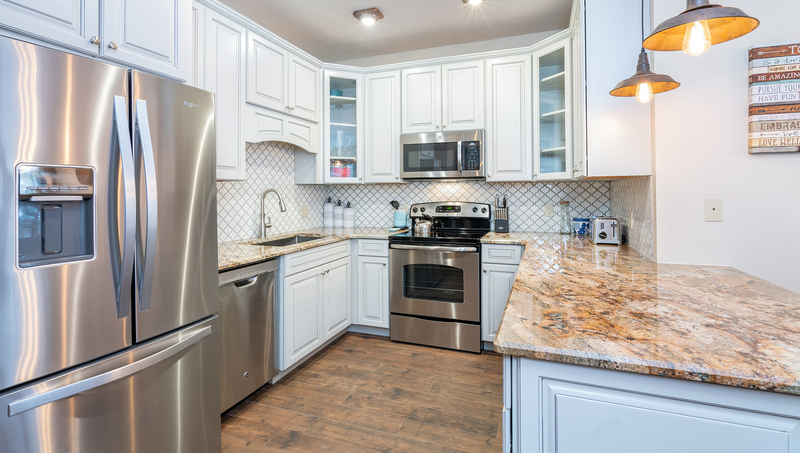 The kitchen features stainless steel appliances, granite counters and all of the dishes and utensils needed for a quality home-cooked meal. The two bedrooms and two bathrooms are located past the kitchen. 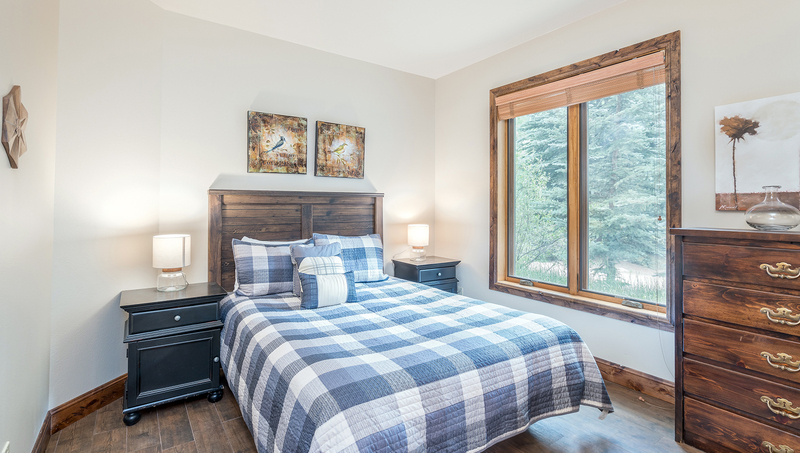 The master bedroom has a queen bed and the second bedroom has two twin beds; both rooms look out onto the river trail. Each bedroom has a flat screen TV. The two bathrooms are located outside the bedrooms off the hallway; both are accessible from the living space. The first bathroom has a rustic, but new, feel and has a step-in shower and vanity. The second bathroom has a shower/tub combo. The condo has complimentary wifi. Ghostriders has a common area outdoor hot tub on the second floor, and laundry room on the ground floor. The parking is an open garage (clearance 8') on the ground level, with space for one vehicle per condo. 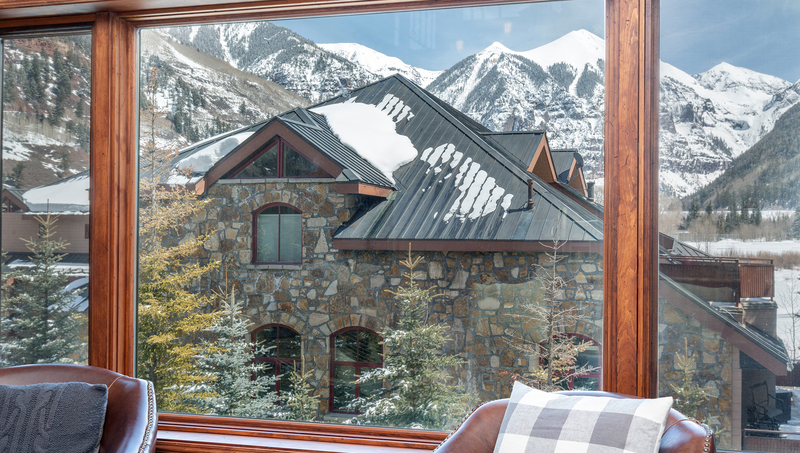 The Complex is just a block off the main street in the heart of Historic Telluride, with restaurants, shopping, the library and apres-ski venues just steps away. It's two short blocks to the Gondola and Oak Street Ski Lift. The best trails for hiking and mountain biking are just out your door. And the Town Park - the main stage for the major Festivals - is just across the river. Conveniently located, Ghostriders is 1 block from the heart of town, 1 block from the Gondola and Lift 8 and sits on the banks of the San Miguel River. This 2 bedroom 2 bath condo has a queen, queen and a queen sofa sleeper. This condo is on the second floor and there is one level to the condo. As you enter, you enter into the living room, kitchen and dining area. There is an updated full kitchen with granite countertops and stainless steel appliances and dining area seating for 4. The living room has a gas fireplace, flat screen TV w/VCR and DVD, stereo CD, queen sofa-sleeper and a large balcony that looks south over the San Miguel River. The balcony has a small propane grill. The 1st bedroom has a queen bed, TV w/DVD/VCR, and private bathroom with shower/tub combo. In the 2nd bedroom is a queen bed, TV w/VCR. 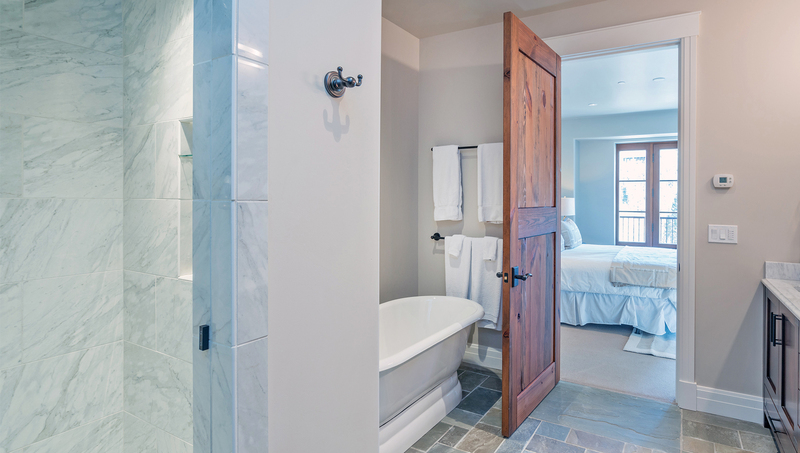 The bathroom for this bedroom is accessed from the hall, with shower/tub combo. 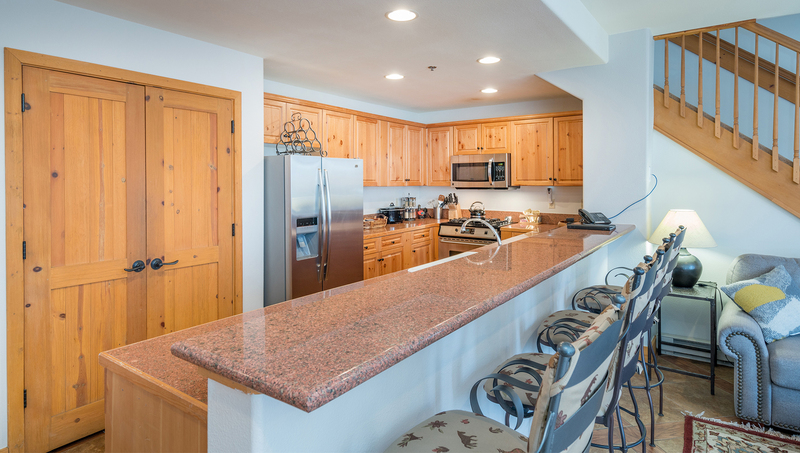 Ghostriders complex amenities include ski lockers, laundry facility on site, outdoor hot tub, covered parking and this condo also has wireless internet.